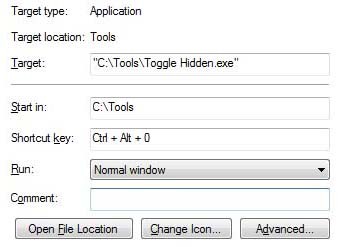 With just one click, this small, portable program will serve as a shortcut to show and hide files and folders that has a hidden attribute. This can be helpful to those who constantly work with hidden files and folders/directories. No installation needed. This is a great tool to have on flash drives. One usually has to open control panel or windows explorer then click folder options then select the proper settings to either show or hide hidden files. This tool shortens that process to a single click. An even more efficient way is to create a shortcut pointing to the program then adding a keyboard shortcut. Its an useful one.thanks for telling about it.